When learning how to trade options volume must always be factored in. Volume is the number of shares or contracts that trade over a specific period of time, usually one day. On a chart, volume is represented as a histogram (vertical bars) overlaid on or below the price chart. This indicator is an essential part of every technical formation as a price pattern will typically have a volume pattern attached to it. In other words, we use it to confirm trends and chart patterns. If a stock is truly in an uptrend, we would expect the volume to also be in a similar pattern. This will increase the chances of the trend continuing. Any price movement up or down with relatively high volume is seen as stronger and more reliable than a similar move on weak volume. 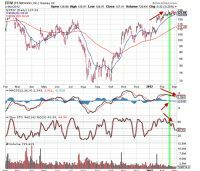 The same guideline holds for changes in the MACD and stochastic oscillators. If we see positive or negative signals in these indicators, they are more significant on high volume and less so on low volume. The green arrow shows a severe price reversal with volume confirmation (green circle) as the volume bars are much higher than during consolidation. Technicians who look for specific chart patterns such as triangles, flags and head and shoulders can also utilize volume patterns to confirm the accuracy of these patterns. Another important concept in technical analysis is that volume precedes price. If volume is weakening during an uptrend, it is oftentimes a signal that the trend is about to reverse. Volume is an essential technical analysis tool that will verify the significance of a price pattern or technical analysis indicator confirmation or divergence. It can also be predictive of upcoming changes in chart patterns. We use volume to corroborate buy/sell signals. A positive or negative signal on high volume is much more significant than one on low volume. Volume surges (1.5 x normal volume) are especially significant. We have made a minor change to how we calculator short-term percentage returns in the “unwind now” tab of the expanded version of the Ellman Calculator. Previously we deducted the option premium from our cost basis as would be done for tax purposes when a position is closed. This approach is not intuitive to many of our members including me. Although the resulting change in miniscule we feel that a case can be made for either approach so we now opt for the one that makes the most mathematical sense. In the example cited in the user guide the % return will change from a 2-week return of 1.8% to 1.74%. Our premium members can access this enhanced version of the Elite Calculator in the “resources/downloads” section of your premium site (“Elite Calculator 2012”). We are also working on updating the Schedule D to reflect the new tax laws. I will send out an email to our premium members and post on this blog when those enhancements have been completed and available to you. For the week, the S&P 500 was up 0.3% for a year-to-date return of 9.7% including dividends. Despite a great start to 2012 and a 25% increase since October 3rd, 2011 investment dollars continue to remain on the sidelines and even shift out of stocks into bonds. To me this is a residual psychological effect that 2008 had on retail investors. Who could blame them? According to the Investment Company Institute there was an outflow of $218 million from stock funds in January and an inflow of $27 billion into bond funds in the same month. With interest rates requiring a magnifying glass to detect, the fear factor remains a key reason why this market hasn’t been even stronger. When the real estate market strengthens and unemployment improves at a quicker pace we could see a full blown bull market. In the interim, we must remain cautious as global and political events can impact our investments despite the good news. BCI: Moderately bullish but still selling an equal number of OTM and ITM strikes. I want to see real estate and unemployment make significant strides before favoring OTM strikes and take a much more bullish stance. Now I’ve made a lot of money with this stock over the years and I tend to be more bullish with my trades when it comes to FFIV. However, I am currently selling about half ITM strikes due to my overall market assessment and decided that this would be best used as an ITM candidate due to the mixed technicals. Had I been more bullish it would have worked out even better (as of today!) but I want to show the thought process and then how to manage from there. When the option was initially sold for $8.62 there was $5.56 IV and $3.06 TV. Using the $5.06 to “buy down” the cost of the stock to $120, my initial profit was $3.06/$120 = 2.55%, 1-month return with 4.4% protection of that profit. This combination return with protection was acceptable to me and met my 2% – 4% monthly goal. This return was guaranteed as long as the stock did not decline below $120 and could not be increased not matter how high the price rose. 3- Buying back the option: The increase in share price does not dictate the sale of the option to close although it is related. It is the option premium approaching parity or all IV that does. When the stock was trading @ $128 and the $120 call was trading @ $8.10, I unwound my position paying $0.10 in time value. All I had to do was generate a higher return than .08% to make this a profitable deal. The cash left to re-invest is $12,000 per contract. My total 1-month return for this cash will probably be between 3-4% even with selling another ITM strike. I respect the fact that investors with a higher risk tolerance than I have may have opted for OTM strikes and there’s nothing wrong with that as long as the decision was based on a firm understanding of all factors. (Click on the chart to enlarge and use the back arrow to return to this blog). According to the running list FFIV reports earnings on April 20th so it won’t be eligible for the April options. Is this another reason to sell in the money strike prices since you will sell the stock anyway after the contract expires? I’m pretty sure I read this in one of your past blogs. Thank you. This is an astute observation on your part. If I plan to sell the underlying in the next contract month due to an earnings report I am more likely to sell an ITM strike. I want to stress though that if the market is strongly bullish and the chart technicals are positive and confirming I may still opt for an OTM strike. With only 2 weeks remaining in the March contracts there are still some good choices. Check out SWI. Current price is 38.50. The March 37.50 sells for 1.85. That’s a 2.3% two week return with 2.6% protection. That bad for two weeks. One additional point to Alan’s analysis…FFIV is showing a “Cup and Handle” chart pattern. According to IBD, this is considered a bullish pattern. It is also one of the most consistent patterns. 1- Those on our mailing list normally receive a mailing on Sunday mornings but didn’t yet today. I’m being told that the professional mailing service we use is undergoing “unscheduled maintenance” (sounds like their having a bad day!). Once this issue is resolved you will receive the email now and going forward. 2- I have experienced an unusual number of email inquiries both from members and clubs throughout the country. This has put me slightly behind in my responses to our members. As always, I will respond to all emails and should catch up in the next few days. 3- Our Weekly Stock Screen and Watch List is currently being formulated and will be uploaded later this evening. We’ll keep you informed and all premium members will receive a direct email when available. 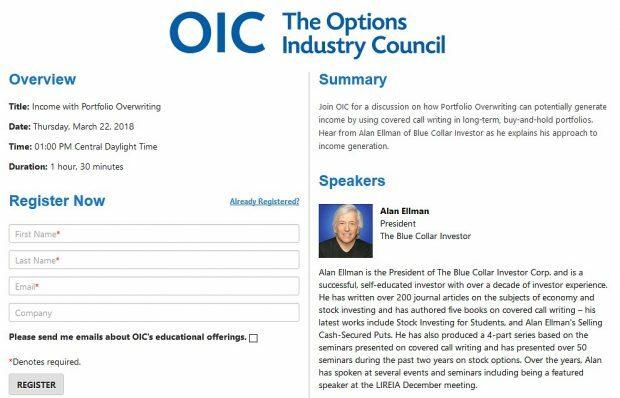 What about open interest and option volume. A few times I found some great appearing trades only to find very low open interest and note volume. “I like to see an OI of at least 100 contracts and/or a reasonable bid-ask spread ($0.30 or less)”. For the option I mentioned in comment #3 for SWI the open interest is 871 and the bid-ask spread is 1.85 – 1.95. The Weekly Report for 03-02-12 has been uploaded to the Premium Member website and is available for download. I do check my portfolio daily but it usually it takes a few minutes unless it is just before or after expiration Friday. Lately, we have been discussing the “mid-contract unwind” exit strategy which has one important determining factor; that is, the option premium trading near “parity”. These guidelines are found in “Exit Strategies….” as well. I appreciate your suggestion and will make every effort to include this information when I use real life examples. Does the options market trade during the same hours as the stock market? Same holidays? Generally yes to both with the following caveat: Option exchanges will stay open a few extra minutes at the end of the day to 4:02 PM EST with the exception of expiration Friday when the option exchanges close precisely @ 4PM EST. A market maker being interviewed on a financial program was defending high frequency trading saying that it benefits retail investors. Does anyone see how this benefits anyone but those who have the cash and access to this elite form of trading? A case can be made for both sides but I can tell you that the SEC is carefully monitoring the situation particularly a problem you will be reading about relating to the high number of trade cancellations caused by HFT. I was recently shocked to learn that high frequency traders have an order cancellation rate (Tabb Group) of over 95%. TRhe cancellation rate for retail investors is between 10% – 20%. According to SEC Chairman Mary Schapiro a large portion of equities trading has little to do with “the fundamentals of the company that’s being traded.” She said it had more to do with “the miniscule aberrational price move” that computer-assisted traders with direct connections to the exchange can “jump on” in fractions of a second. Hence trades are constantly being entered and cancelled until the best deal is executed. The SEC is actually considering charging a fee for these cancellations but is also concerned about its potential impact on market liquidity. If the trade of a stock is suspended through Expiration Friday, how would this affect the rights and obligations of Options sellers and buyers? In particular, will the stock of a Call Options sellers be automatically delivered for the ITM situation? Can the Put Options buyers exercise their rights for stock delivery? Will the cash be released in a Cash Secured Put position after Expiration Friday? 1- The exercise of an ITM call option will depend on two factors. First, the instructions that the call holder has given to his broker. He may not want to exercise an ITM strike for a halted stock. Second, has the stock been removed from the “exercise by exception ” program. This is where the clearing house will automatically exercise ITM calls even if it in the money by only $0.01. Depending on the day that trading is halted will dicate whether the option remains part of the program. It is determined on a case-by-case basis. (I BELIEVE it is removed from the program if trading is halted prior to Wednesday but I’m not positive). 2- Yes, put option buyers can exercise their rights for stock delivery. 3- Yes the cash is released after expiration Friday in a cash-secured position. That being said, I recommend you check with your broker for the specifics of a halted stock, particularly if it remains part of the automatic exercise program. Our stock market is at the mercy of a tug of war going on between fears of a failed Greek debt swap and an improving US economy. On Tuesday the former shook the market and our portfolios took unrealized hits. Wednesday our economy took charge with the ADP employment report coming in at 216,000 jobs added above the 203,000 estimated and the 173,000 from January. Thursday morning, as I write this post, the futures look strong. Market pschology(fear and greed) will always play a role in our stock market but should never be a factor in our Blue Collar decisions. I bought VCLK @ 19.43 and sold the March 20 for a nice 4% return. Today the stock is @ 20.40 and if I roll to the April 20 the return is under 2%. Can I expect a better return if I roll closer to expiration? Thanks for your help. More likely than not, your return WILL be greater as expiration Friday approaches. The time value of the near-term contract will decay at a greater rate than that of the April contract. Of course, much will depend on the implied volatility of the option later next week. Share price up over $4 today. After a disappointing 3/11 earnings report this company has reported three consecutive strong reports. In addition, analysts are projecting earnings growth of over 50% for both 2012 and 2013 while its industry peers have projected earnings growth of 7% and 25% for the next two years. Our premium report shows an industry rank of “A” anda beta of 1.41. 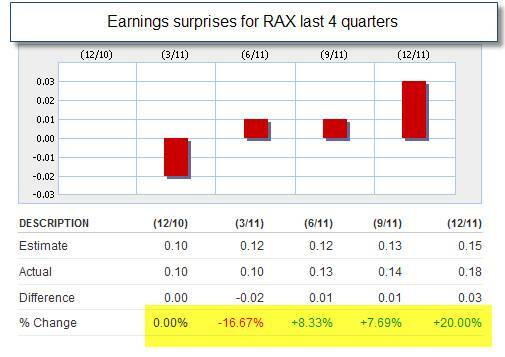 See the chart below for earnings surprises (click on chart to enlarge and use the back arrow to return to this blog). Good article I’ve found that volume can be a good confirming indicator. VSA or volume spread analysis had some good applications.